Keep a look at this page regularly. Here we keep posting as to whats coming up soon. Brief : One-man film unit's journey to one of the remotest deserts of the world on the Indo-China Border. Here's the trailer of Riding Solo To The Top Of The World. The trailer will take a few minutes to load, depending on your internet connection. 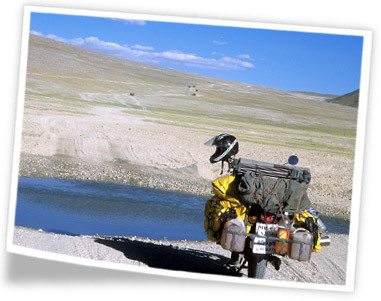 Riding Solo... is a film about filmmaker Gaurav Jani's solo motorcycle journey from Mumbai to one of the remotest places in the world, the Changthang Plateau in Ladakh, bordering China. Situated at an average altitude of 15,000 feet, Changthang covers almost 30,000 square kilometers of Ladakh. It is a land devoid of roads and with temperatures that dip to minus 40 degree Celsius in winter. As a one-man film unit, he astonishes you, filming the landscape he passes by and the people he interacts with; capturing moments of beauty, pain, love, hardship, self doubt and spiritual triumphs. Jury Award at Vatavaran Nature and Wildlife Film Festival. The film leads the viewer from revelation to revelation, giving us an opportunity to come to love and know the 'Changpas' and their unique lifestyle. Technical Award for Sound Design - Dwarak Warrier at the Indian Documentary Producers’ Association (2006). A delightful documentary with simple but good sound of consistent quality, with the sound track adding to the film tremendously. Technical Award for Editing - Sankalp Meshram at the Indian Documentary Producers’ Association (2006). The film kept the viewers' interest alive for 94 mins in a feat of sleek editing. Documentary - Gaurav Jani at the Indian Documentary Producers’ Association (2006). A true celebration of the documentary, this solo adventure translates into a film that is an experience both personal and universal.